We have to swallow our pride and hand it to [Dan200]. He may have finally found an application that everyone can agree is a perfect fit for Arduino. 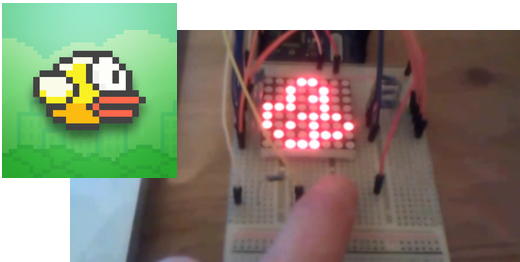 Flappy Bit is [Dan’s] Arduino Uno based Flappy Bird clone. [Dan] is a software guy at heart, but he’s taken a peck at electronics of late. Flappy Bit was just a fun side project for him to learn how to program the Arduino. The hardware consists of an 8×8 LED matrix, current limiting resistors, and a single button. [Dan’s] implementation isn’t 100% faithful to the iOS/Android original. Rather than simply parrot Flappy Bird, he changed it up a bit. The user presses and holds the button to climb, and releases it to descend. This seems to make the game a bit more forgiving. We also won’t be missing all the lovely sound effects from Flappy Bird. While there is less flapping in Flappy Bit, it does make us more nostalgic for those tabletop LCD/LED games we played in the 80’s and can’t stop crowing about today. [Dan] has released the full source code to the project (Pastebin link), and there is more information available on his reddit thread. Give flappy bit a try. You won’t egret it! More reminiscent of the Helicopter game! Nice though! I wonder if he will turn it into a fully stuff board so he can flock with it anywhere. Just add a little speaker for sound and it would make a great little gaming platform to teach kids. Will this be his next mod for minecraft? Somebody already built it with command blocks. Can i see the schematic of flappy bit?